I came up with this recipe one night when crunched for time and craving something other than a bowl of cereal. And it’s super good. Fresh basil goodness with a punch of saltiness from the Parmesan and capers. I think you’ll adore it just as much as I do. Preheat oven to 400 degrees. Line a rimmed cookie sheet with foil and spray liberally with cooking spray. Set aside. Toss cubed potatoes with 2 tablespoons of olive oil, salt and pepper. Spread out on foil-lined baking sheet and roast, stirring occasionally, until potatoes are browned and cooked through — approximately 20-25 minutes. While potatoes are roasting, combine 3 tablespoons of olive oil, basil, toasted nuts,Parmesan cheese, garlic, lemon juice, salt and pepper in a food processor and blitz until very well blended. I like my pesto on the thicker side, but if you’d like it thinner just add more olive oil and blitz again. Once the potatoes are done roasting, put them in a mixing bowl and add the pesto. Carefully toss everything together until the potatoes are well coated. Stir capers into the mixture and test for seasoning. I usually add more pepper at this stage. Divide potatoes into serving bowls and top each with a small basil leaf and some fresh Parmesan before serving. Yum! Why Yukon Gold potatoes though? I’m not too experienced with them. Those just happen to be my favorite, although you could use any kind of potato. What a great meal – seems you are good under time constraints. 😉 Can’t think why I have never thought of pairing spuds and pesto. This sounds delicious- i looove pesto and the capers are a great idea! Striking photo too! I’m sorry you haven’t had much time to cook lately 😦 You’re still making delicious things though! I love pesto and capers have really grown on me. I bought some purple potatoes the other day so I think I will try this with the ones I got! 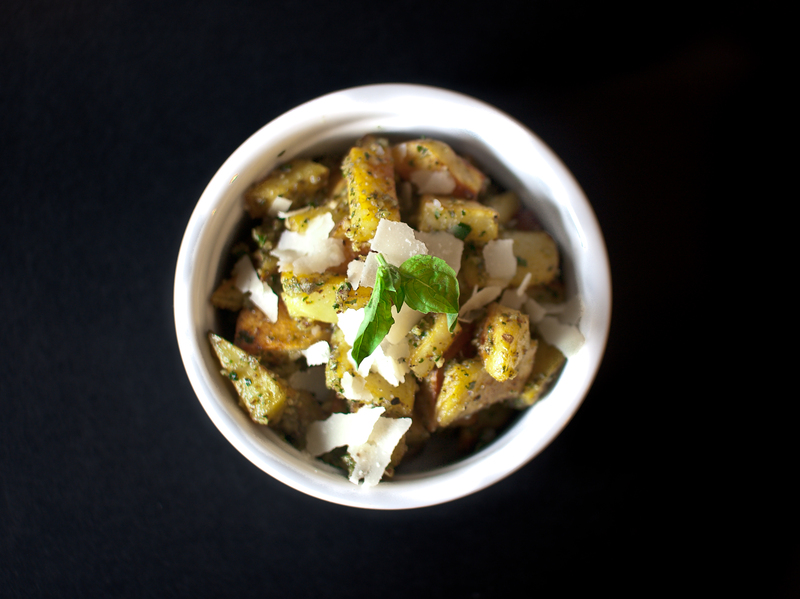 Pesto and potatoes? Say no more, I’m already in love. I hear ya …. no time to cook = neglected food blog. I made pesto a few weeks ago and was stunned at the flavor and time it took to make. Delicious. Love this potato idea! Bookmarked.